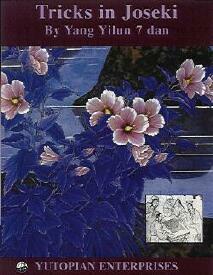 Tricks in Joseki is the second volume of Yang Yilun's Pocket Series available from Amazon. 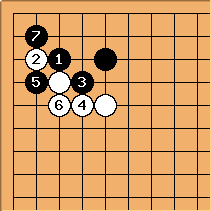 The small, thin volume (designed to fit in one's pocket) contains 80 joseki problems. 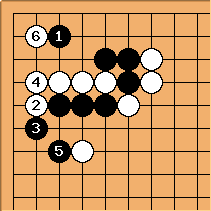 This is not a book on how to use hamete, but rather how to respond to poor moves which look somewhat natural and could occur often in games of people who aren't familiar with joseki. This volume contains 3-4 point josekis only. The purpose of the problems are to increase ones reading ability. As such, studying this volume is demanding, requiring one to read several, at times many, variations to select the one that best suits the local situation. Problems appear on the right-hand or odd-numbered pages with three solution diagrams on the left-hand or even-numbered page immediately following. Here is an odd play. 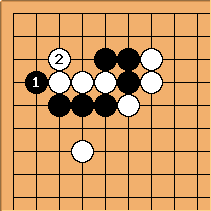 What is the proper response for Black? 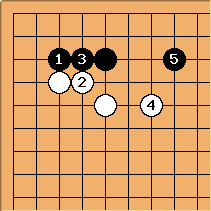 is the key point to take advantage of White's move. is proper (honte?). 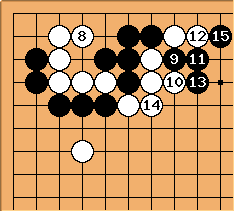 Up to the sequence is good for Black. 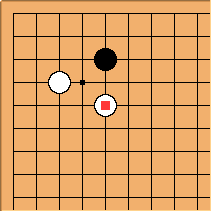 After Black plays at , White plays at . 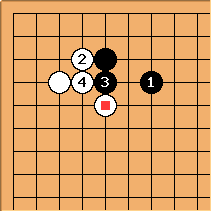 Black helps his single stone and creates cutting points in White's shape. This isn't good for White. is loose. and are good moves. 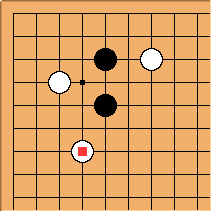 White's corner is big and becomes wonderful. This is too thin. 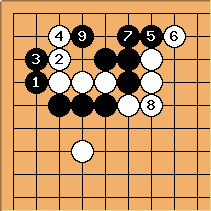 how does Black refutes it ? 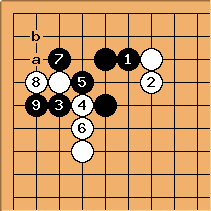 Imagist The two stone edge squeeze isn't trivial for kyu players to read in the previous diagram. If at a, at b. 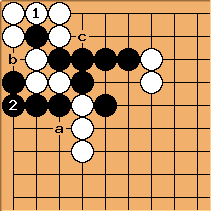 If at b, at c.
Iago So this is not in the book : if White plays as before, Black should capture I guess, but I see both W a and B b ending badly for Black... Any thoughts ? 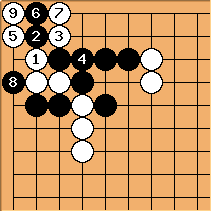 White wins in any variation I could find Is there a tesuji somewhere that I missed ?? Herman: Here's a variation that works. 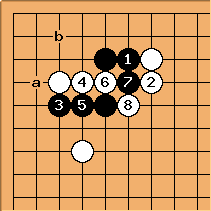 Note that is sente because of the two cuts. 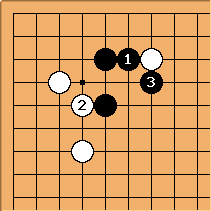 After , black has an eye while white does not, and will win the capturing race. Herman: White cannot resist with here. 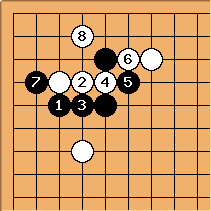 Black will exploit the two cuts, and white will lose big time.